What is the difference between the self and the soul? Soul is like the air in a balloon, and self is like the air in the atmosphere. Why is it that sometimes we don’t trust in the Guru. Why do we have doubts that arise? Should you follow the Guru? I am asking you. How many of you think that you should follow the Guru, raise your hands? (Everyone in the audience raise their hands). If you are following the Guru, that means the Guru is also walking. He hasn’t reached the goal. See, the Guru is someone who knows more than you. So the Guru is standing up and he is giving a hand to the one sitting down. Guru is looking down and giving the hand down. If you also do that, where will you be? Just imagine a ladder, where Guru is on the top and looks down and gives you a hand. If you follow the Guru, which means that you also look down and give your hand down, then what will happen to you? When Guru looks down, you look up and give your hand up, and then you keep going up. If you follow the Guru, he looks down and you look down, you will never reach. 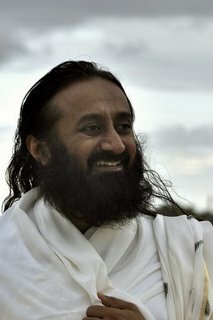 So, don’t follow the Guru (everyone laughs loud as Gurudev explains a complete catch 22 situation). Guru is looking down and giving his hand. You should do the opposite. You look up and give your hand. How can you reach if you do what your Guru is doing? Should you follow the Guru? If you are following the Guru, it means the Guru is walking and you both are walking, which means you are not sure if the Guru has reached the destination. And if you say, that I don’t follow the Guru, then there is no Guru at all (Laughter). Like, if you say, I don’t take medicine means you had no doctor. If Guru says something and you don’t follow it, then you have no Guru. If Guru says “Don’t follow me”, and you don’t follow the Guru, then you have followed. And if you follow the Guru, then you have not followed (laughter). Devotee: Okay, so then we just drop ‘follow’. How about ‘trust’! Doubt your Guru as much as you can. The Guru is not there to give you trust, in fact he puts a lot of doubts in your mind so that you bake and boil in the doubt, and become strong. If you don’t trust the Guru, then he is happy; he is free. It is better for him if you doubt.If someone trusts you, then you have a responsibility. If no one trusts you then you have no responsibility; happy-go-lucky. So, why will the Guru try to keep your trust, he is happy to put more doubts so that you boil, work on it, and then walk. When they become mature, they will come back themselves. The Guru’s idea is to make everyone strong, and all these doubts will make you strong, and if your trust remains after all these doubts, then that is the real thing. If there are a thousand occasions to doubt and still your trust is there, then you are something! You are like a diamond. But if you keep doubting on the small things, then you are like a corn flake. How light is a corn flake? You blow a little and a corn flake will fly away. If you are like a dew drop, then with a little bit of sunlight, a dew drop dries away. Or you can be like a diamond, which stays the same. And when the sunlight comes the diamond shines more. So why would the Guru help you hold on to your trust? Then it would be a weak trust, someday it will blow away. So doubt as much as you can, cook in your doubt, because truth is beyond doubt. Truth is something which can never be obscured forever.Everyone will discover the truth one day. Suppose mist is there, will the mist make the mountain disappear? No! What will the mountain say, “Let the mist come and go, who cares?” When you wait for a little bit of the sun (of knowledge) to come, all the mist (doubts) disappears. While coming here in the morning, there was so much mist, but nobody stopped driving. You doubted but you didn’t stop because something deep inside you made you keep moving. Even though doubts hang around, something makes us move, and that is our soul wanting the truth. Our inner will soul move in the direction of truth. He said, “You are kidding. Tell me the truth”. When a person doesn’t trust themselves then they start doubting others also. Doubting others is related to doubting oneself. Someone who has a lot of self-doubt will also keep doubting everybody. I said, “Yes, then you believe in that”. So, if you say that ‘I don’t follow the Guru’, then that person is not your Guru at all. If you don’t take the medicine given by a doctor, then that man is no more your doctor. If I take medicine from you then you are my doctor. If I learn something from you then you are my teacher. If I say ‘I don’t learn anything from you’, then you are no longer my teacher. So if you say ‘I don’t follow the Guru’ that means he is not your Guru. If you say that you are following the Guru, that means your Guru has not reached. If you say you are not following the Guru, then that person is not a Guru to you at all. So what is the answer to this question? See, Guru has reached the goal; he is at home and he is only welcoming you. There is no question of following. Devotees: We are just chasing you wherever you go! If you are chasing your Guru, means your Guru is also running (roars of laughter). You once said that Guru is a presence, it is not a person, what does this mean? See, certain questions have no answers. If you have to say whether you follow a Guru, the answer is neither ‘Yes’ nor ’No’. If you say ‘No’, then the question has no meaning. If you say ‘Yes’, then it has no meaning. You say, ‘Yes and No’. ‘Yes’ means you have a Guru. ‘No’ means you are not following your Guru because Guru has already reached and he is giving you his hand. When the Guru is looking down, you don’t look down, you look up. When the Guru is giving his hand down, you don’t give a hand down, you should give your hand up. Got it! If you say you got it means you didn’t get it, and if you say I didn’t get it, then you got it (laughter). 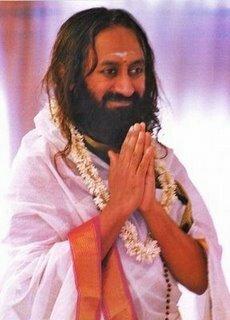 If someone asks you, ‘Do you follow the Guru?’ You can’t say ‘No’ and you can’t say ‘Yes’. Some questions you have to answer then differently. 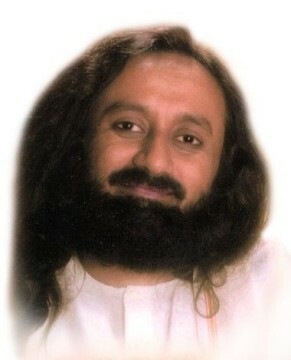 Gurudev, we keep asking you questions. Do you have a question that you would like to ask us? I am asking you this question, ‘Do you follow a Guru?’ I ask everyone questions all the time; I ask them ‘How are you?’ ‘Are you happy?’ Though I know the answer still I ask. These are the only questions I ask, and I am not looking for answer. I ask the question only to engage you. I am asking questions so that you feel good about it. My questions are not for myself, my questions are for you, to make you happy. This is a secret I have shared for first time. I never tell this secret to anyone.